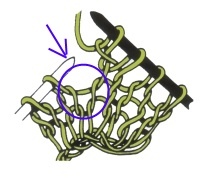 How do you insert right needle under loose strands and knit together with next stitch? I don't understand this direction in the pattern! It is the thread running between the stitch you have just knitted and the next stitch, so it is down one row. What you do is to lift the bar between the stitches and put it onto the right hand needle. Then you can knit the bar and the next stitch together.